Counter weight limit switch, GEARED LIMIT SWITCH, ROTARY GEARED LIMIT SWITCH, COUNTER WEIGHT (GRAVITY) TYPE ROTATING GEAR LIMIT SWITCH, GRAB DIFFERENTIAL LIMIT SWITCH, LIMIT SWITCHES. 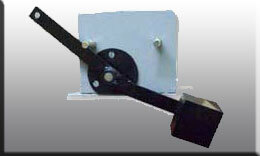 MAGCO COUNTER WEIGHT LIMIT SWITCHES are used for Heavy duty E.O.T. Cranes, Hoists to prevent over travel of hoisting motion on power and control circuit up to 500 v.a.c. and 40 Amps. continuous current.